The goal of the Davis Real Estate Fund is to provide investors access to attractive investment opportunities in companies related to the real estate industry. The Fund applies our signature Davis Investment Discipline to real estate, seeking companies with first-class management teams who view real estate as a means of producing steadily increasing income and strong returns on capital. 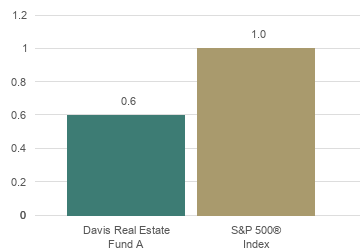 The charts below illustrate the long-term performance and diversification attributes of the Davis Real Estate Fund. 10 year US Treasury is represented by the Citi 10 Year U.S. Treasury index. Inflation is represented by the Consumer Price Index. The performance presented represents past performance and is not a guarantee of future results. Total return assumes reinvestment of dividends and capital gain distributions. Investment return and principal value will vary so that, when redeemed, an investor’s shares may be worth more or less than their original cost. The total annual operating expense ratio for Class A shares as of the most recent prospectus was 0.97%. The total annual operating expense ratio may vary in future years. Returns and expenses for other classes of shares will vary. Current performance may be higher or lower than the performance quoted. For most recent month-end performance, click here or call 800.279.0279. Applying the Davis Investment Discipline to real estate-related businesses, potential asset allocation benefits for investors, Portfolio characteristics, holdings, performance, and more. Portfolio Managers Andrew Davis and Chandler Spears discuss the real estate market, Portfolio companies, and recent performance. This material must be accompanied or preceded by a current Davis Real Estate Fund Prospectus. You should carefully consider the Fund’s investment objective, risks, charges, and expenses before investing. The prospectus contains this and other information and can be obtained by clicking here or calling 800.279.0279. Read the prospectus carefully before you invest or send money. 1Diversification does not insure against loss.